Small Telescope Spectroscopy by Olivier Thizy of Shelyak Instruments. This is the complete one hundred forty five (145) page color illustrated presentation in English by Olivier Thizy of Shelyak Instruments, presented at the NEAIC conference on 18 April 2013. This is one of the most informative and easy to comprehend presentations on the subject. It was produced by Mr. Thizy who has extensive experience with not only the science of spectroscopy and applications, but also with teaching spectroscopy to a broad audience. Included are explanations in layman: terms of: the history of spectroscopy, the science of spectroscopy, and uses of spectroscopy with an overview of the technology and available equipment ranging from simple diffraction gratings up to complex guiding spectrographs and associated CCD systems. The document is lavishly illustrated with photos, graphs and readouts acquired by the instruments discussed herein. Shelyac equipment discussed includes their: diffraction grating spectrograph, the Star Analyzer spectroscope, the Alpy 600 modular spectrograph and calibrator, the LISA spectrograph, Lhires Lite handheld, spectrograph, the Lhires III spectrograph, and eShel professional optical fiber fed spectrograph. If you are interested in knowing what spectroscopy is about, or entertaining the prospect of acquiring instruments for this work then you should be reading this document. This thirty (30) megabyte document provided as a Adobe .pdf file (30,996,233 bytes). • and FUN to contribute! He goes on to explain the why about the above premises. The document too is well illustrated with photos, graphs and readouts acquired by Shelyak:s instruments. Mr. Thizy offers advice about setting up programs and events suitable for high school level education and for public event audiences. This presentation goes into more detail about spectroscopy and analysis of results including: demonstrating how the rotational period of Saturn can be measured, a discussion about spectroscopic binaries, photometry and spectrophotometry, pulsating stars, symbiotic stars, microquasars, robotic observations. Shelyac equipment discussed includes their: the Alpy 600 modular spectrograph and calibrator, the Lhires III spectrograph. If you are interested in knowing more what you can do with spectroscopy, or entertaining the prospect of acquiring instruments for this work then you should be reading this document after reading the one above. This eighteen (18.4) megabyte document provided as a Adobe .pdf file (18,389,406 bytes). 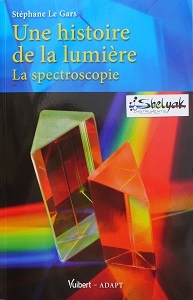 Shelyak Instruments Spectrographs Catalog 2014. 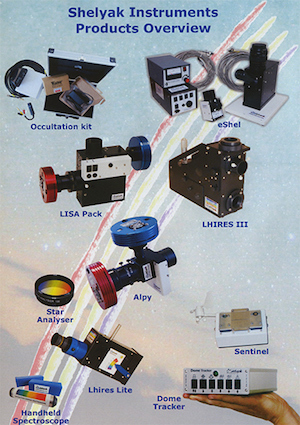 This is the moderate resolution (200 dpi) scan of the complete sixteen (16) page color illustrated catalog describing and illustrating the Shelyak spectrographs offered at Company Seven including: Handheld Spectroscope, Lhires Lite, Star Analyzer, Alpy and Alpy Calibrator, LISA and LISA Pack, LHIRES III, eShel. Also shown in the index but not described are the Occultation Kit, Dome Tracker and Sentinel. Document scanned by Company Seven and provided as a Adobe .pdf file (2,809,320 bytes). coming soon. Content will be available from Company Seven as video and software files delivered in a DVD or download. These references were complied and cataloged by Shelyak Instruments to help you find a suitable book depending on your interest. This list is sorted by theme, then by language (English or French), and by interest (a very subjective criteria of course). Since Company Seven is a distributor of books by many scientific publishing houses you may contact us to obtain current pricing and availability, and to order of course after all it is your support that makes our development and hosting of this resource possible. Feel free to visit our showroom, or contact us by telephone (301-953-2000), or send E-Mail. [Français] Ces références ont été compilés et catalogués par Shelyak Instruments pour vous aider à trouver un livre adapté en fonction de votre intérêt. Cette liste est triée par théme, puis par langue (anglais ou français), et par intrêt (un critére trés subjectif bien sûr). John B. Hearnshaw is professor of astronomy in the department of physics and astronomy of the university of Canterbury, New Zealand. This edition has been extended to year 2000, and thus cover the history of astronomical spectroscopy from early nineteenth (Fraunhofer study of solar spectrum absorption lines) to late twentieth century (discovery of exoplanets). This is a master piece of historical review of astronomical spectroscopy through this time. A must have in your library, now widely available in this second edition. Founded in 1911, the AAVSO boasts over 1200 members and observers and is the world's largest nonprofit organization dedicated to variable star observation. This book marks the the AAVSO's centennial year, presenting an authoritative and accurate history of this important association. John B. Hearnshaw is professor of astronomy in the department of physics and astronomy of the university of Canterbury, New Zealand. Somehow following his top book 'the analysis of starlight', he reviews here several spectrograph design from an historical point of view. The selection of the spectrograph presented in this book are sometimes arbitrary. It is a little bit thin and could have been extended with some more recent spectrographs, including commercial spectrographs from Shelyak Instruments. John B. Hearnshaw, professor at University of Canterbury, New Zealand, wrote here a survey of astronomical photometry, showing the advent of new technology. An interesting chapter on Isaac Newton, and the last chapter on the birth of astrophysics which would have deserved more work and space in this book. Some interesting stories on this important observatory where Otto Struve was located. Un livre facile à lire et très intéressant en général, et plus particulièrement le chapitre sur Pickering et les femmes qui ont fait la spectroscopie : Williamina Paton Flemming, Antonia Caetana Maury, Annie Jump Cannon... mais aussi Cecilia Payne-Gaposchkin (cf livres écrit par elle par exemple). Astronome à l'Observatoire de Paris et spécialiste des galaxies et de la matière interstellaire, James Lequeux consacre la fin de sa carrière dans des ouvrages plutôt historiques. Celui-ci fait une revue générale de l'astronomie et de l'astrophysique de 1910 à 1970. Un historique succinct mais toutefois intéressant sur la spectroscopie. Une collection très bien illustrée et facile à lire. Cet ouvrage explique comment sont vu et expliqués les arc-en-ciel selon les époques; un très bon livre historique. A recent book with some interesting example of public outreach and astronomy education, important for those willing to do public outreach in astronomy in general and astronomical spectroscopy in particular. Based on IAU Symposium 260 in Paris (France) on January 19-23, 2009 (International Year of Astronomy). An original and unique way to look at astronomy : James Kaler paints intimate portraits of the 100 stars he likes best. Several of them would be ideal targets for your backyard spectrographs ! A compact but rather well structured and complere book on astrophysics. An old book but which may be of some interest for those willing to do public outreach in astronomy in general, and astronomical spectroscopy in particular. 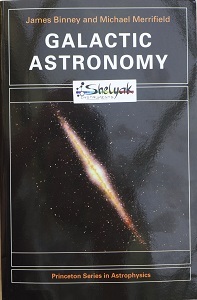 A general overview of astronomy in the middle of the twentieth century, Shelyak mainly recommends the chapters on the physics of the stars and variable stars. Agnès Acker est une astronome professionnelle de l'université de Strasbourg, reconnue notamment pour son travail sur les nébuleuses planétaires. Cet ouvrage est malheureusement épuisé mais est une source intarissable de projets en astronomie pratique. Chercheur au CNRD et au Centre d'Etudes de Saclay, l'auteur propose un très bon support de cours de cosmologie avec relativement peu d'équations (mais un peu quand même). Une revue concise et simple de l'évolution des étoiles. This reference handbook â€“ from one of the top grating manufacturers contains much key information about this technology. Emeritus Professor Immo Appenzeller (University of Heidelberg, Germany) offers us a complete and comprehensive introduction to astronomical spectroscopy. While he doesn't cover available off-the-shelf commercial spectrograph for amateurs and universities, this book is a must read. Dr. Chris R. Kitchin (University of Hertfordshire) wrote here a concise graduate textbook â€“ a must have in the library of astronomical spectroscopist to understand how spectrographs work and to have some basics on astrophysics. The author (Instituto de Astrofisica de Andalucia) gives a very good introduction to this subject as it relates to optical spectroscopy. Fist published in 2003, this book does require a good working knowledge of mathematics. The author (University College London) gives a comprehensive review of the subject. Dr. Thackeray started at the Solar Physics Observatory (Cambridge) before moving to Radcliffe Observatory in Pretoria, South Africa. This book presents the subject of astronomical spectroscopy as known in the middle of the twentieht century. It is an excellent book for beginners even now. This second edition was published 19 years after the first one. The book is very well organized (a flow diagram is even provided on first back cover) and is intended for the one interested in designing their own instrument. This book is around lightweight, low cost, portable 1 to 2 meter telescopes being developed by the Alt-Az initiative, an enthusiastic group of amateur telescope makers, instrumentalists, and professional astronomers who are pushing the state-of-the-art for the fun of it. While not covering spectroscopy, this book gives some good insight on how to perform scientific measurement with a CCD camera. And often photometry can lead to spectroscopy, the two technics being somehow related and often required in parallel to study astronomical objects. Spectroscopy is covered over four chapters of this book by Daniel J. Schroeder (Department of Physics and Astronomy, Beloit College, Wisconsin, USA). This book is for people interested in designing their own spectrograph. Professeur à l'université Claude Bernard de Lyon, Roger Duffat nous livre ici un excellent livre sur l'optique couvrant des sujet aussi vaste que la spectroscopie, la polarimétrie mais bien plus encore ! A reference but also a collector book as this EAS vol 47 publication series is the proceedings of the Oleron pro/am CNRS school in 2003 which triggered the development of the first Shelyak Instruments instrument : Lhires III. This book covers some theory, some instrumental and software aspect of spectroscopy, but also includes some key reference articles for pro/am collaboration or just educational projects (comets, nebulae, Be stars, Sun). A good & recent review of commercial spectrographs available at that time. Another book from the Springer's Patrick Moore's practical astronomy series, where Ken Harrison help beginners with grating spectroscopes (such as the Star Analyser) to start in astronomical spectroscopy. This is a complete (at his time, commercial spectrographs offering from Shelyak Instruments has largely increase since then) guide for the amateur spectroscopist. Several aspect of this book would require a more in-depth description â€“ but links to key internet or book resources are provided to go further. Practical amateur spectroscopy was a key book at his time, regrouping articles from several authors. But technology and now off-the-shelf commercial spectrographs from Shelyak Instruments make this book a little bit outdated. A previous version of the now published in Springer book from Jeff Hopkins (Hopkins Phoenix Observatory) : using commercial amateur astronomical spectrographs. In more than 400 pages, Frederick R. Chromey (Director of Vassar College Observatory, USA) introduces the fundamentals topics in optical observational astronomy for the undergraduates, based on his almost 40 years of experience in this area. Spectroscopy is only a small subset of this book on digital imaging. Gerald Hubbell provides there a very good companion for anyone dipping their toe into the digital imaging realm for the first time. A very good starting point toward a more scientific approach, leading eventually to a more a professional and amateur collaboration. This book chronicles the remarkable resurgence in small telescope astronomical research sparked by three technical breakthrough : compact Schmidt-Cassegrain telescopes, personal computers, and affordable CCD cameras. This book is a collection of articles written by several authors. This book could appear dated especially on the subject of spectroscopy where so much has happened for the advanced amateur astronomer since its publication, but it does include some fundamental content which are still current. Translation by Alan H. Batten of Paul Couteau's book â€˜Lâ€™observation des étoiles doubles visuelles' published in 1978. While not specific to spectroscopy, this book can be interesting from an historical perspective but also give some idea of project to run including Radial Velocity measurements on closer spectroscopic binaries. En plus de 700 pages, cet ouvrage écrit par plusieurs auteurs présente une vue synthétique des outils et méthodes de l'observation astronomique en ce début du XXIè siècle. Cette édition est bÃ¢tie sur une série de cours de niveau doctoral. Ecrit par un collectif d'auteurs, cet ouvrage met en perspective le développement historique des moyens d'observations astronomique ainsi que le rôle des équipes de chercheurs français et européens dans les découvertes qu'ils ont permises. Un chapitre couvre la spectroscopie avec la mesure de la température des étoiles avec un simple Star Analyser devant un objectif photographique. Gerhard Herzberg, a research professor of Physics at University of Saskatchewan (translation by J.W.T. 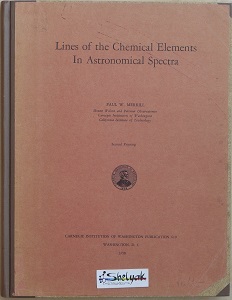 Spinks) offers us an old but excellent book to understand how spectral line are formed. A very pictorial review of each element, and with interesting stories about each of them. Based on the lectures given by professor Garhard Herzberg (National Research Council, Canada) at Cornell University in 1968, this concise volume is a distilled version of his monumental three-volume study, molecular spectra and molecular structure. Authorative and clearly written, it comprises a superb resources for anyone interested in a concise, yet complete treatment of the fundamentals of molecular spectroscopy. A more complexe volume compared to 'atomic spectra and atomic structure' from the same author. Un très bon roman (le précédent du même auteur était aussi très bon) qui mélange science et fiction. Il parle de façon didactique tout au long du roman de la théorie de la mécanique quantique, ce qui en fait un ouvrage particulièrement intéressant pour mieux comprendre cette théorie et l'histoire de son développement. Une collection très bien illustrée et facile à lire. Cet ouvrage montre comment l'univers est vu en fonction de la 'couleur de ses lunettes' ! Une collection très bien illustrée et facile à lire. Cet ouvrage fait la revue de la lumière avec un chapitre important sur le fluorescence. Découvert d'abord en laboratoire et reconnu par la communauté des physiciens qu'en 1928, le plasma existe naturellement sur notre planète (ex : la foudre) mais est également très présent dans la magnétosphère, le Soleil, les étoiles, etc. Un ouvrage particulière fin mais bien illustré sur la lumière et l'optique. La lumière et l'optique à travers les Ã¢ges. Un ouvrage avec peu d'illustration mais assez intéressant bien qu'ancien. In over 1200 pages, the authors provide the most authoritative textbook available on modern astrophysics for undergraduate astrophysics courses. This reference book - a must have in your library â€“ does contain some equations but most subjects are accessible without mathematical knowledge. The first edition of this reference book was written by Leo Goldberg & Lawrence H. Aller in 1943. It a very good course textbook accessible to a wide audience. A must read book edited by George Herbig (Lick observatory, University of California) after Otto Struve death in Berkeley on april 6, 1963. It includes a series of articles written by Otto Struve from 1933 (spectral classification) to 1945 (spectroscopic binaries). This book is a precious list of peculiar object to study with your spectrograph from your backyard! A good overview of stellar physics but a lack of exemple of actual star spectra to illustrate makes this book more theoretical rather than practical. But it is a comprehensive book on astrophysics for amateur, without the complex equations that most undergraduate books include. A rather old but excellent well illustrated and complete book on astronomy & astrophysics in general. Dr. David Emerson (1943-1996) was at University of Edinburgh. This reference book describes how physical conditions such as temperature, density and composition can be obtained from the spectra of a brod range of astronomical environments ranging from the cold interstellar medium to the very hot coronal gas and from stellar atmospheres to quasars. Each chapter is written by a different author and list a good set of references at the end. The book is edited by Eugene H. Avrett (Smithsonian Astrophysical Observatory) and provides the reader with a comprehensive overview about astrophysics knowledge at that time. Un livre assez simple mais très complet qui donne une très bonne revue des bases de l'astrophysique et de l'évolution stellaire. Un 'must-have' dans votre bibliothèque ! Un ouvrage complet, support de cours d'astronomie et d'astrophysique et particulièrement complet pour l'astronome amateur qui souhaite aller plus loin dans la compréhension de l'Univers. Un peu plus récent que l'ouvrage 'Astronomie & astrophysique' de Séguin & Villeneuve, il est tout aussi complet et du même genre. Un livre indispensable pour démarrer sa bibliothèque. Agnès Acker est une astronome professionnelle de l'université de Strasbourg, reconnue notamment pour son travail sur les nébuleuses planétaires. Alors que la première édition (1978) était un support de cours un peu en vrac, cette édition est particulièrement bien structuré. Passionnante, la lecture de cet ouvrage demande parfois un peu de connaissance mathématique. En dépit des 449 pages du livre, certaines parties donne envie d'aller plus loin ce qui demande souvent la lecture d'ouvrages en anglais... Un livre à absolument avoir dans sa bibliothèque de spectroscopiste qui veut comprendre ce qu'il observe voir trouver des idées de projets à mener. Lucienne Gouguenheim est professeur à l'université Paris-Sud et est spécialiste de la radio astronomie. Son livre est un excellent support de cours d'astronomie et d'astrophysique. Il est particulièrement adapté aux astronomes amateurs sans trop d'équations mathématiques. L'auteur (université de Strasbourg) nous livre là un cours assez complet d'astrophysique pour niveau Master (première année), avec un bon niveau mathématique nécessaire à sa compréhension. Un ouvrage complet, support de cours d'astronomie et d'astrophysique et particulièrement complet pour l'astronome amateur qui souhaite aller plus loin dans la compréhension de l'Univers. Un peu plus ancien que l'ouvrage équivalent de Comins, il reste assez complet et intéressant. James Kaler demonstrates very nice writing skills which make his books easier to read and comprehend than many others. 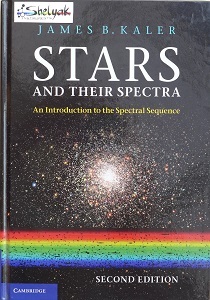 While it is not a new edition of 'stars' by the same author, this book covers the same concepts and it clearly a must have for every astronomical spectroscopist willing to better understand behind the scene of spectra. David F. Gray (University of Western Ontario, Canada) gives here one of the best book for astronomical spectroscopy with lot of references, ideas of projects to run from tour own backyard (with several spectra presented with star identified) and more ! The text does require some knowledge of mathematics to be fully comprehended. This astrophysics textbook for advanced undergraduates is very well illustrated, and contains several numerical exercises with solution explained. A clear course for stellar astrophysics for those willing to go beyond the introductory texts. Here equations are often well detailed and explained. Is a blending of an astrophysics book for beginners and an atlas too as this book includes many tables with list of stars for example. Dina Prialnik (Tel Aviv university) gives here a textbook for undergraduates in astronomy or physics. While the mathematics required for his book is rather strong, one of the key part is the exercises at the end of each chapter â€“ with solutions !!! James Kaler has a very nice writing skills which make his books easier to read than most others. This one is clearly one of the best books on the subject: very well illustrated, and a great journey through stellar astrophysics! While it is in some aspects outdated by the 'Cambridge Encyclopedia Of Starsâ€™, this remains a very interesting book to browse through. Excellent astrophysics course in three volumes from Erika BÃ¶hm-Vitense (University of Washington). It does require the reader possess some knowledge of mathematics. Excellent astrophysics course in three volumes from Erika BÃ¶hm-Vitense (University of Washington). As is the case with Volume 1, this does require the reader possess some knowledge of mathematics. Excellent astrophysics course in three volumes from Erika BÃ¶hm-Vitense (University of Washington). As is the case with Volumes 1 and 2, this does require the reader possess some knowledge of mathematics. Proceedings of the summer school on stellar physics XVII a La Rochelle on September 24-28, 2007. This is a reference book well suited for anyone interested in this field. A rather comprehensive book, well written about stellar evolution and how stars work. Undergraduate level with some mathematical knowledge required. Some interesting target for your backyard spectrograph. As always with James Kaler, this is a very nice book to read. An old but still very interesting reference book in two parts (four were planned but not sure if third and fourth volumes have ever been published). Dimitri Mahalas (Yerkes Observatory, University of Chicago) is an expert on stellar atmospheres. Here he has written a graduate level textbook which does require a strong knowledge of mathematics. A rather old book with some historical interest. Some Be stars are covered in several articles. Based on a GRETA meeting held in Fréjus (France) on May 11-13, 2005. This is a graduate level book which requires a strong mathematical knowledge. A. C. Phillips (department of physics and astronomy, University of Manchester) provides here a concise textbook requiring a strong knowledge of mathematics. This graduate level textbook by William K. Rose (University of Maryland, College Park) requires very strong mathematical knowledge. Proceedings of the third Harvard-Smithsonian conference on stellar atmospheres. 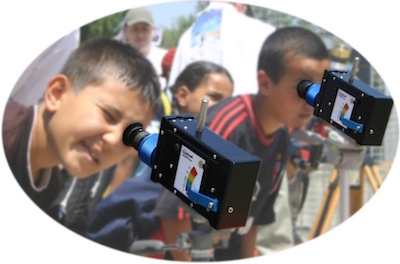 Provides a good list of educational projects to conduct with your spectrograph. First published in 1939 by Subrahmanya Chandrasekhar at Yerkes Observatory, this volume is the second in the series of the 'astrophysical monographs'. It is an outstanding treatise on stellar dynamics from one of the world's outstanding astrophysicists. This book is now somewhat dated, more a collector item and does require some good mathematical knowledge, but remains fascinating. Publié d'abord en 1926, cet ouvrage requiert parfois un bon niveau mathématique. Il est surtout devenu un ouvrage historique à replacer dans son contexte â€“ celui du début de l'astrophysique. A dated book which interests those who have mainly an historical interest. The author (Associate Professor of Astronomy, University of Michigan) gives here a rather complete course on stellar atmospheres. At the end of each chapter, some problems are given to work on. Un ouvrage écrit par plusieurs auteurs, parfois un peu hétéroclite mais particulièrement intéressant et accessible à l'astronome amateur sans bagage mathématique. Le livre est de plus très bien illustré. Traduit par J. Rossignol et faisant suite à des publication en français dans le bulletin de la Société Astronomique de France, ce livre fait suite à une série de conférences démarrée au congrès d'Oxford de 1926. Le seconde édition corrige surtout l'identification du nébulium par le Dr. I.S. Bowen à l'automne 1927 comme étant une transition de l'oxygène ionisé deux fois. Ce passionnant ouvrage est à remettre dans le contexte de son époque ce qui en fait un livre plutôt historique maintenant. 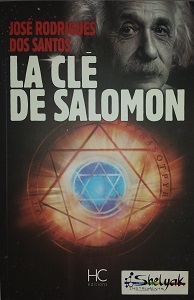 Ce livre fait le lien entre l'enseignement de la physique fondamentale et celui de l'astrophysique au niveau Master. Un bon niveau mathématique est nécessaire pour la compréhension de cet ouvrage qui débute sur la physique stellaire puis couvre le milieu interstellaire. De nombreux exercices (corrigés) sont proposés. Edité par la Société Suisse d'Astronomie et d'Astrophysique, cet ouvrage regroupe les notes de cours organisés à Saas-Fee en mars-avril 1971. Les conférenciers sont Dimitri Mihalas (University of Chicago), B. Pagel (Royal Greenwich Observatory) et P. Souffrin (Observatoire de Nice). L'ouvrage nécessite une excellente connaissance mathématique pour être lu. Great concise but complete picture of the closest star : the Sun. While the author explains many of the things that we know about our Sun, this book also discusses much of what remains unknown to the scientific community. Obviously, there remains much work for future generation of scientists! This book is based on course for graduate students, but it is of interest to a broader audience. This book is based on course for graduate students, but can be of interest to a broader audience. Some interesting review of our Sun's spectrum and physics. Requiring strong mathematical knowledge, this book is a set of lectures and tutorial reviews devoted to the gravitational aspects of the Sun and their geophysical consequences. Proceeding of the international colloquium held at Observatoire de Haute Provence (France) on august 22-25, 2005. A key milestone in this fast moving research field! Based on the 31st Swiss Society of Astrophysics and Astronomy course held in April 2001 on brown dwarfs and planets. Excellent and authoritative book â€“ a complete review of the subject for graduate students. Comprehensive monograph on the subject, ideal for those hat want to go further in studying planetary nebulae. The second edition of a classic text, almost thirty years after the first edition this new edition (460 pages) is valuable to anyone seriously interested in this field. Some of the content requires strong mathematical knowledge. Also look for free resources from the web, these will include: "Spectroscopic Atlas", "Practical Aspects of Astronomical Spectroscopy", or "Analysis and Interpretation of Astronomical Spectra" by Richard Walker, available there in English and other languages too. And the guide by François Teyssier to low resolution spectroscopy. This would be the second reference book on the subject, maybe easier than that by Gray & Corbally 'stellar spectral classification'. It has been the major book for many astronomical spectroscopy observers as it goes through each spectral type and the HR diagram, pointing out interesting objects to look at with your backyard spectrograph. This new edition from Cambridge University Press is clearly a key item for your library. OK, this is THE reference book on stellar classification. Almost 600 pages cover standard and peculiar stars, with copious amounts of spectra examples and tons of ideas for education, and advice about collaboration in spectroscopy projects that can be run from your backyard. Each chapter includes a very good reference list so you can even go beyond the book and extend your knowledge for any object presented there. Really The Bible for astronomical spectroscopy observers! This book takes an interesting approach as it is sorted by element. For each element, it gives the spectral type where it can be seen and the Equivalent Width depending on spectral type or temperature. Before 'stellar spectral classification' by Gray & Corbally, this was the reference book on stellar classification. Still, it does contain criteria to fine tune the spectral classification, for example based on line intensities. This remains a highly recommend book for those interested in advanced work on stellar classification. This is part a major work by CNRS & NASA to provide in-depth knowledge of the understanding of stars (standard and peculiar) at that time. Note : il y un résumé en français au début de l'ouvrage. Download the PDF from NASA. This is part a major work by CNRS & NASA to provide in-depth knowledge of the understanding on stars (standard and peculiar) at that time. While is not a first book to have, this is a reference book with lot of diagrams showing the energy level transitions for typical lines in astronomical spectra. A true reference book to have if you are looking into spectral analysis at high level of details. This book has mainly an historical interest (love the pictures of David F. Gray and of the earlier stage electronic detector arrays!) and most chapters are signed by great names of astronomical spectroscopy. An atlas of stellar spectra recorded with film which would need an updated version with modern CCD technology and instrumental response corrected spectra. Voir aussi d'autres références sur le web : le guide de la spectrosocpie basse résolution de François Teyssier. This book provides a concise overview of variable stars, including a historical perspective, an introduction to stars in general, the techniques for discovering and studying variable stars, and a description of the main types of variable stars. It is extremely well written and accessible to all amateur astronomers. It is a highly recommended book on variable stars in general. Alan Cooper worked on low energy and very high energy nuclear reactions and Norman Walker at the Royal Greenwich Observatory until its closure as a working observatory. This old but still very interesting book is a journey through the HR diagram (covering most variable star types). While primarily written with photometry technics in mind, this book aims to bridge the gap between the dedicated amateur and the fully fledge professional astronomer â€“ it is well adapted for you to browse through the different type of targets you could reach with your spectrograph as well. A good photometrical atlas of variable stars with a long list of references. Unfortunately, it does not cover spectroscopy. Translation of the french book 'les étoiles variables' published in 1982. While rather old, this is an excellent atlas of variable stars, classified by type & sub-type and with list of main stars for each category, a great inspiration for backyard spectroscopists! While it is a great book from an historical perspective, several article are worthwhile to read and can provide some interesting ideas for backyard astronomical spectroscopy projects : beta Lyrae (Shelyak), T Tauri, general overview of variable stars. An old book which appeals today to those with mainly a historical interest. This is the first reference book for graduate students on astroseismology. It does provide a general introduction to astroseismology (first chapter can easily be read, as an overall review) and a comprehensive coverage of all its aspects. It does require some strong mathematical knowledge. Great short (approx. 150 pages) book on this subject, first published in 1995. This book comes with a CD-ROM and is the proceeding of the astroseismology workshop held in Porto, Portugal on July 1-5, 2002. Requiring some mathematical knowledge for some articles, those proceedings are still of great interest for the amateur astronomical spectroscopy observers looking for new projects to work on. Several stars studied at that time would be great targets for continuous monitoring with off-the shelf spectrograph from Shelyak Instruments, modern CCD sensors and typical amateur backyard telescope. First published in 1993, this book is for beginning students on stellar physics and introduces the fundamentals of stellar structure and evolution. Fully comprehending this does require the reader have some good mathematical background. This is a reference book for undergraduates with strong mathematical knowledge. IAU symposium 272 held in Paris (France) on july 19-23, 2010. This is the latest key symposium on this subject and as such is a key reference book highly recommended for those interested in early type stars such as Be stars, P Cygni & LBVs, Herbig Ae/Be, etc. The 'review' articles are strongly recommended as first reading. Astronomical Society of the Pacific Conference Series 355. Proceedings of a meeting held on Island of Vlieland, The Netherlands July 10-16, 2005. Astronomical Society of the Pacific Conference Series 214. IAU Colloquium 175 held in Alicante (Spain) on June 28 â€“ july 2 ; 1999. Some article are key reviews of the knowledge at that time. A very good review of emission line early-type stars which requires some mathematical knowledge. Calculation of the temperature of nebulae based on line intensities (with a list of result for several nebulae) is provided with details. While this may be considered as an old book with only an historical aspect, it remains a good overview about the early-type stars, so this is highly recommended for those interested in those stars and their properties. Astronomical Society of the Pacific Conference Series 337. Proceedings of a meeting held in Johnson City, Tennessee, USA on July 7-9, 2004. Those proceedings are also illustrated as the text is accompanied by pictures taken during the meeting. Thesis of Coralie Neiner. Note : un résumé en français est donné à la fin de la thèse. Proceedings Of The Paris (France) Workshop Held June 9-12, 1997. Some of the review articles are interesting to read, and there are several targets which can be picked from for further backyard astronomical spectroscopy monitoring and study. IAU symposium 162 held in Antibes (France) on October 5-8, 1993. IAU symposium 98 held in MÃ¼nich (Germany) on April 6-10, 1981. IAU symposium 70 held at Bass river, Massachusetts (USA) on September 15-18, 1975. An excellent book (actually a course handbook) with very nice illustration and clear example/exercise to work on (with solutions). This textbook is a reference for advanced graduate end graduate students and highly recommended for any serious amateur interested in binary stars in general. An excellent colloquium (attended by three amateurs) on mysterious binaries ; those are the proceedings. Epsilon Aurigae is a very mysterious system with 27 years long period. In 2009-2011, an eclipse ocurred, similar to that of 1983. This book provides some historical background of the 1982-1985 campaign as well as some preparation for studies for the 2009 eclipse. This is a book for specialists with very strong mathematical knowledge and numerical simulation understanding. A rather old book based on a conference in Italy in 1980. This is the most recent key reference on classical novae with some history, an overview of novae properties followed by detailed thermonuclear processes, evolution of nova systems, nova atmospheres and winds, abundance studies, the evolution of dust and molecules in novae, nova remnants, and observations of novae in other galaxies. THE reference book on symbiotic stars, the one to have if you are interested in such objects; first published in 1986. Brian Warner, astronomer at Cape Town (South Africa) observatory, published the first edition in 1995. It is a complete overview of the cataclysmic variable stars with lot of spectroscopy details, line identification, explanation on several observed phenomena. An excellent book for amateur astronomers on the cataclysmic variable stars. It does provide some astrophysical background with minimum mathematics involved and it does list several targets to observe. This book is the perfect companion for your observing night with your backyard astronomical specrography! Well illustrated, this book unfortunately only covers the photometry observations of those variable objects and does not cover spectroscopy at all. Still, it is a good overview of those objects...maybe for the second edition? This is part a major work by CNRS & NASA to provide in-depth knowledge of the undertanding on stars (standard and peculiar) at that time. Note: il y un résumé en français au début de l'ouvrage. Translated by Marc Damashek. While a little bit old and outdated, this book covers a critical subject still valid today : the study of supernovae and stellar wind. This is one of the key reference for novae with some historical & statistical review of novaes until middle of XXth century, details seen in spectra with a classification for novae. A must-have for those interested in novae! An easy to read book on the story behind the discovery of one of the most fabulous object in our galaxy: SS433 microquasar. The book also goes through some models for this object.